16 November 2018 (Toronto, ON) — Imamu Amiri Baraka’s Pan-African manifesto It’s Nation Time — African Visionary Music, out of print since 1972, is available once again via Motown/Ume/Universal Music Canada, the country’s leading music company. The spoken-word jazz album, originally released on Motown Records’ Black Forum subsidiary, has been repressed on 150g black vinyl with tip-on jacket in a faithful reproduction of the original packaging. Order It’s Nation Time — African Visionary Music now here. A poet, writer, theater director, activist and more whose career spanned five decades, Baraka (born LeRoi Jones) fearlessly vouched for racial equality until his passing in 2014. For It’s Nation Time, his first album, Baraka was backed by many threads of African-American musical expression, including a funk band led by James Mtume and a free jazz quartet featuring bassists Reggie Workman and Herbie Lewis, pianist Lonnie Liston Smith, alto saxophonist Gary Bartz, and drummer Idris Muhammad. 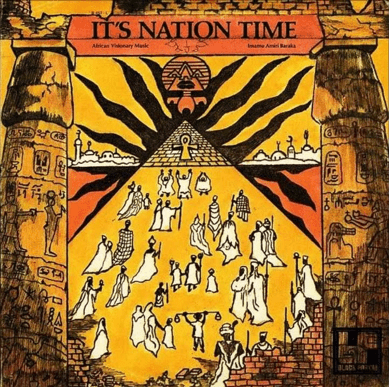 More than four decades later, It’s Nation Time is thrilling and evocative. Over an R&B groove, “Who Will Survive” ponders who will be left standing in the midst of Western carnage. (“Some Americans, very few Negroes, and no crackers at all,” Baraka dryly reports.) “Who we are is the magic people / The black genius prophets of the planet,” he insists in “Answers.” In “Pull the Covers Off,” Baraka calls for liberation in syncopation over Bartz’s high-powered horn. On “Come Back Pharoah,” he forms a call-and-response with backing singer Gwen Guthrie ten years before she was a solo star. In addition, this “African man’s vision/version of music,” as it states in the liner notes, was newly mixed in stereo from the original analog master tapes by award-winning engineer and producer Russell Elevado (D’Angelo, Jay-Z, Erykah Badu, Kamasi Washington, et al). It’s Nation Time — African Visionary Music sums up all of the late Baraka’s brilliant dimensions and rough edges. On this beguiling, outspoken lost album, we hear a brilliant artist fighting fire with fire in a socially, politically and racially precarious moment in American history. Whether familiar or unfamiliar with the unique, prolific Baraka, fans of experimental music with forthrightness should look no further than this uncompromising work.